It’s been a long time coming, but I’m finally retiring “The Humanaught” moniker. It’s been a good run, but time to hang up the handle and start publishing under a domain I’ve been sitting on for a couple years now — ryan-mclaughlin.com (that’s the cue to update your bookmarks). I started using “The Humanaught” back in November 2003, when I created a LiveJournal blog to capture my travels as I set out with a backpack and a couple of guidebooks, anxious about leaving my home continent for the first time. Amazingly the LiveJournal site is still there, though all the posts have long-ago been imported here. After 5 months of travel I returned home and the Humanaught blog went on hiatus as I went about saving up money for my next grand adventure — not knowing at the time that it would eventually lead to living in China for more than half a decade. In the fall of 2004 I registered thehumanaught.com and began playing with creating my own Web site, eager to reformat the content I had created while travelling, while also preparing for my move to China in January 2005. This is when I discovered Blogger, and their ability to publish a blog using their management system but your own hosting. At the time it seemed somewhat akin to the promise of flying cars. I continued blogging this way until May 2006 when I moved completely to a self-hosted blog using WordPress for the first time. Considering what I do with my days now, it was an auspicious move to be sure. Truth be told, I grew tired of “thehumanaught” quite some time ago. At first it served to add a bit of anonymity, which seemed so much more important in the early days — long (in Internet time) before Facebook shared the details of my life and Twitter captured every fleeting thought that flitters through my brain. Additionally, over the years I’ve been using it I had built a small but (mostly) respectable name for myself in the online sinosphere, and that was the name I was known by. But I think it’s fair to say that most people who know me by “the humanaught” now also know me as “Ryan”, and for the people yet to get to know me, I’d rather we get started on a real-name basis. 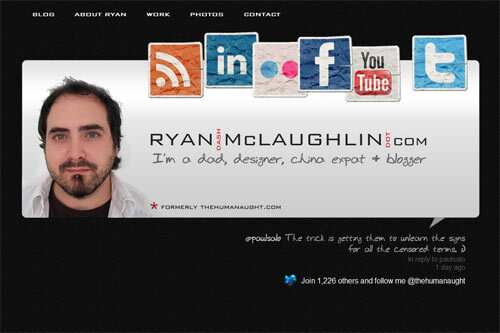 I’d be being a bit disingenuous if I didn’t also say that moving to ryan-mclaughlin.com wasn’t also to help establish, build and control my personal branding. It’s not exactly a term I’m comfortable with or really feel worthy of, but I cannot escape the fact that I make my living online and my reputation (and by extension, name) play a large factor in that. The last, but potentially largest, reason for the re-dubbing is simply that the focus of this blog has changed a lot since it was first created. Originally it was my outlet for sharing travel tales and stories about living in China. And while I’ll still be blogging about both on occasion, most of my about-China writing takes place at Lost Laowai these days, and travel … well for the time being at least, our new baby has made us pretty stationary (* with the exception of some rather large news I’ll be writing about soon). And so here we are, a new dawn of sorts for this site. A new name, a completely new look (which I’m still tweaking) and hopefully a bunch of new content — untethered and gloriously unfocused. Some blogs are about specific things, this one is just about me and everything I like to think/talk/write about. I hope you enjoy it. See all Farrago, Special Days posts. Tagged: changes, site-news, the humanaught. Love the layout Ryan and certainly get what your saying. I have gone back and forth myself about my site names. Wishing you continued success in everything you do! I have to admit I’ll miss The Humanaught since it’s helped keep us connected ever since you headed out on your adventure in 2003 (can it really be that long ago?). But as long as you keep the blog going I’ll be happy. Thanks Dad, and no worries, the site will continue ever trekking on. What’s more, as I find time I’m revisiting some of those old posts from my early travels and cleaning them up (re-importing comments and images that were lost when I first brought the posts over from LiveJournal/Blogger). I’m also working out a way to make those posts easier to read with a “from the beginning” layout that will sort the posts chronologically rather than in reverse chronological order, as they are now.